under Elizabeth Tudor. 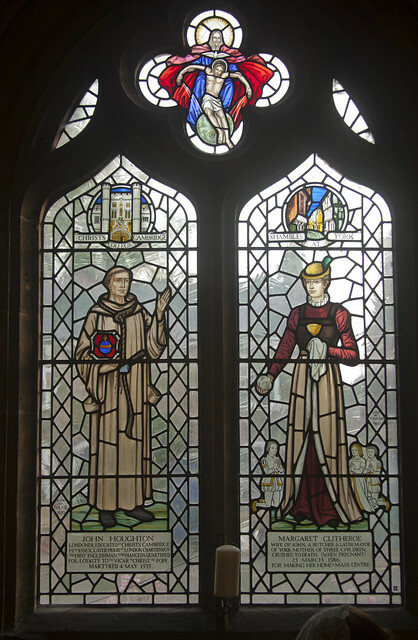 Stained glass from St Edmund's College Ware. This week I can't do much if any blogging, so I shall be reposing this series of posts from September 2014. Further to my posts about 16th and 17th century Anglicanism and the Islamic militants of today, a similar argument has now been made in a mainstream publication, The Week, by its Senior Correspondent, Michael Brendan Dougherty. Dougherty's focus is on the policies which led up to, and responded to, the Irish Potato Famine of 1847: much closer to home than the Tudor persecutions. He makes an interesting point about local dissidents being used as a proxy for foreign enemies, a point related to something I have been saying about the problem of the Church being aligned too closely with the decadent West. In this post, however, I want to explore another aspect of the problem. If we are to talk about the past, and the bad things which happened there, which may or may nor have parallels with the present, the question arises of the what attitude the modern successors of the evil-doers should have to it. This problem is more acute for the Catholic Church than for most religious groups, for two reasons. One is that it is the oldest institution on earth, of which one can say: this man here is the lineal successor of that one from the distant past, with a recognisable institution around him. The English monarchy is not as old as the Catholic Church by nearly five centuries, on the most generous analysis, and I can't think of any other institution around today as old as that. Almost any event you care to mention in European history since about the third Century has the Catholic Church as a protagonist, and often she is the only one still around to shoulder any blame which might be going. The other reason is that the Catholic Church does not repudiate her past teaching. As I remarked in my posts on Anglicanism, Anglicanism today is completely different from the Anglicanism of the 16th century. Modern Anglicans can, if they like, simply say that Cranmer (for example) was wrong. Why not? Catholics can't as easily say that important figures from the Catholic past were wrong, because of the way their writings and actions are bound up with the irreformable teaching of the Church. Sometimes, of course, they were wrong - there have been bad priests, bishops, popes, and Catholic kings and emperors - but the disentangling of personal and doctrinal, fallible and infallible, human and divine, in the Church can be a complicated business, and it is understandable if victims of criminal Catholics become a bit impatient with the argument. To keep things simple, let's consider phenomena with which the Catholic Church can be said to be involved, at least at a human level, which are reasonably recent and unequivocally bad. There are two obvious ones: antisemitism and paedophilia. Historically, there have been Catholic anti-Semites. We need to repent for this, and we have done so, not least through the words of St John Paul II. I think this is not quite right. Repenting for the sins of others is a bit too easy - or would be, if it were not impossible. St John Paul II didn't repent, he didn't need to, but he apologised. What exactly that meant remains controversial. I would suggest that it implies, for starters, a willingness to undertake two things which we may, in particular cases, need to do. First, as the institutional successors of criminals, we may need to compensate the victims. The English Provincial of the Rosminians, Fr David Myers, once protested that to pay compensation to victims of historic child abuse would take money away from his order's current charitable activities: it would punish the innocent of today. Well that's too bad. If an institution seeks to benefit from its past, the buildings and institutions and endowments and so on, it must accept responsibility for the bad things as well. Second, we must show that we do not endorse the ideological underpinnings of past crimes. Which is to say, whatever arguments were advanced for anti-Semitic attitudes, or, in the case of paedophilia, for the strange combination of sexual antinomianism and clericalism which permitted and covered up the crimes, are not arguments whose criminal conclusions we accept, and are not arguments which are valid in relation to the authentic magisterium. I have in fact written in this vein on both subjects: the errors involved in the attempted justification, from a Catholic perspective, of an attitude of hostility to Jews, and on the theological distortions at the root of the blind eyes which were turned to peadophilia, and also here and here. There is something else we need to do, which is on a more spiritual level, and may also be part of what St John Paul meant by his apologies, and what Fr Lucie-Smith means by 'repentance'. I shall talk about it in the next post: it is spiritual reparation. 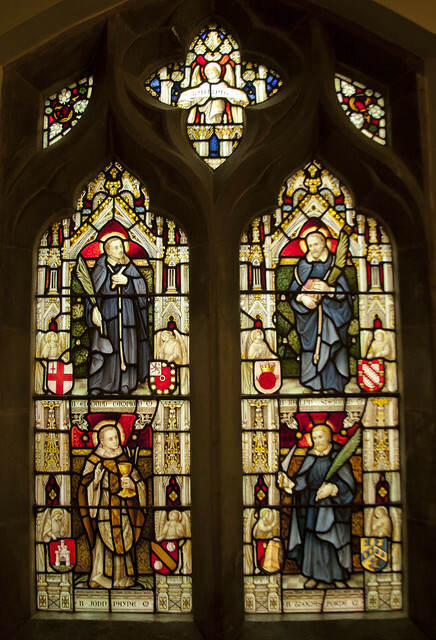 of priests, martyred in York under Elizabeth. Stained glass from St Ethelreda's, Ely.